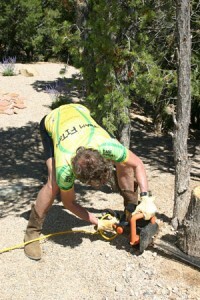 My life and that of a lumberjack rarely intersect, but when they do, it’s a work of art… If not a little abstract. I was out on a ride today, enjoying my beautiful still summer day, 3 hours of cruising around on my 2 wheeler. Is there a better way to spend a morning? When I returned home Michelle had the chainsaw out and was trying to get rid of a stump. That’s the little trick she learned from her grandmother. Ladies listen up! 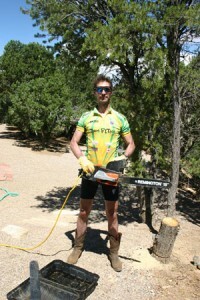 If you want your husband to do something around the house, get out the power tools and start it yourself. More often than not, he will take over the job! And that’s just what happened here. So she’s there in her bathing suit – I’m pretty sure she waited until I was in sight before she bothered to start – trying to get the chainsaw to work. My nephew was there and took a few pictures. These make me think of the Monty Python song – I’m a lumberjack. Please feel free to hum along.